Securing and maintaining a domain name is one of the basic steps in building your website. Here’s how the process works. * Redemption of MY Domains is free of charge, however, gTLDs and SG Domains require a Redemption Fee as per Registry policies. Learn more about this in the Redemption section below. The first step is to check if the domain name you want is still available. If no one else is currently using it, then you can claim it through a company such as Vodien. Domain names registration is similar to getting a lease; you pay a fixed amount to be able to use it for a given period. A domain name may be registered for one year up to 10 years, depending on your domain names registration subscription. Within this period, your domain name is considered active. You will be notified when the registered period is about to end. If you pay the renewal fee, then the domain name stays active. The registered period after renewal is still one to 10 years. If you don’t renew the registration, your domain will be put on hold. Those who try to access your website will be redirected to a page announcing that the domain has expired. You also will not be able to transfer your domain name to another registrar at this time. 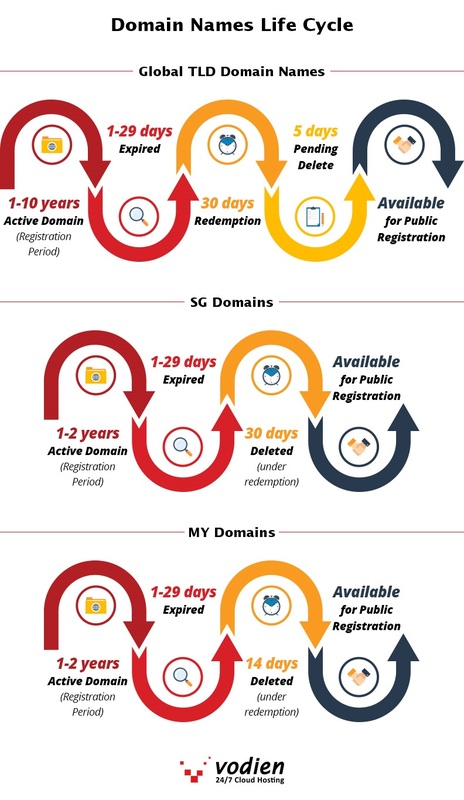 The expired status lasts from 1 to 29 days for all of the domain names. You can still renew your domain within this period. After the expired period has lapsed, the domain will go into redemption period for 30-days which still makes it possible for you to renew your registration; however, the registry charges a reinstatement fee to reinstate the domain name. The whole reinstatement process is manual and takes about 1 working day to complete. This is definitely not a recommended method, clients are advised to renew their domain before expiry. Note: For .com.sg and .sg domain names, the status will show as Deleted when you do a WhoIs lookup. You need to count the number of days from the expiration date to know if the domain name can be reinstated or not. At this stage, your domain name is already about to be deleted from the registry and can no longer be restored. After deletion, it becomes available again for registration but you will now have to compete with other people who may want to register it as well.